Stepping Up To The Garden In Bourne. There’s just something about being able to sit in a light filled space and see your garden in all its splendour. The English are a nation of nature lovers and the desire to connect on a daily basis is a common ideal. 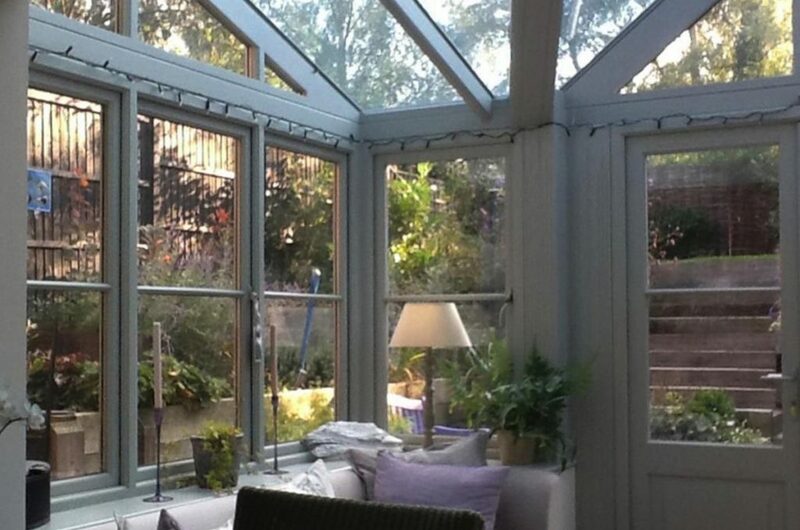 Adding a conservatory, orangery or garden room to you home is one of the best ways to bring your garden indoors. This was certainly the aim for this family from Bourne. Their traditional brick and tile house had been built at a time before supermarkets when people grew their own food. In those days the garden was simply a of producing vegetables and keeping a few chickens. Leisure time was precious and homes were not built to provide the connection to outdoor spaces that we love so much today. Extending living spaces on a site where the house is built below the garden level, is not easy. 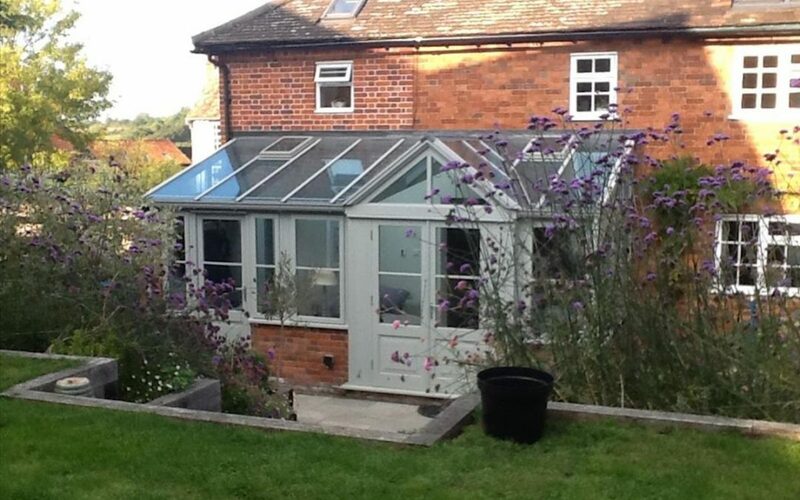 When we were asked to design a conservatory for this Bourne property, we knew there was going to be ground works involved if we were to create a practical space that flowed directly from the existing home. But with some heavy machinery, some new retaining walls and nine brand new steps between the French doors of the new conservatory and the grass level above, this new extension ticks all the boxes on our client’s list. One of the great advantages of being a long established company is that we have a wealth of not only experience to fall back on but also the ability to create bespoke solutions for potentially challenging situations. And that’s exactly what we needed to do with this Bourne property. Starting from the ground up, we matched the bricks around the base of the extension as closely as possible to the brick of the house. We then designed what is essentially a hardwood lean-to conservatory with the addition of a gable end section to make a feature of the French doors to the garden. Roof windows were added for ventilation and the framework was finished in a beautiful soft grey-green that perfectly compliment the colours of the garden planting. And now that the conservatory is finished it looks beautiful from the outside and the inside. 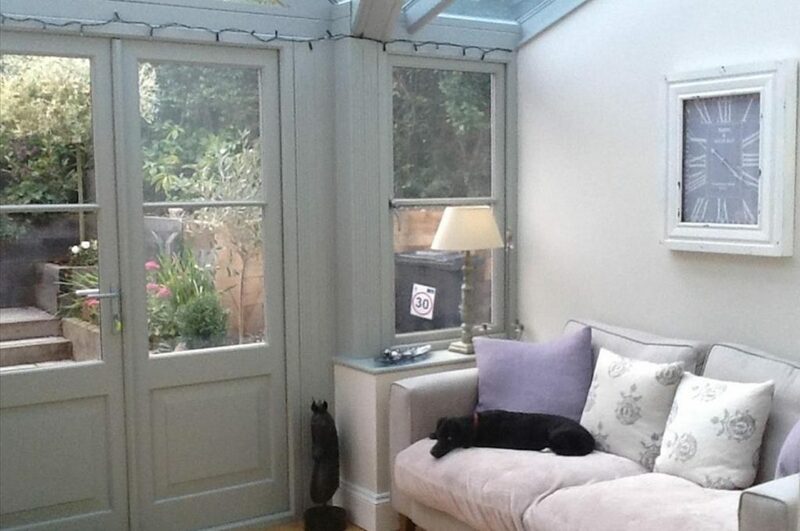 Even the cat’s found a spot on a sofa placed to take in the garden view beyond the doors perfectly.